BabyThe little one who gives so much promise and joy. LoveThe kindness, warmth and trust that you share with another person. BirthdayThe day to look back at the friendships and experiences that you have enjoyed through all this time. FestiveA time to gather amongst friends and families to enjoy the traditions and to celebrate each moment in life. GraduationThe step into the future that you have been anticipating. The beginning of a new, exciting and fruitful phase in life. Balloon is happiness. Need a gift for a special someone? Or a little something to lift up the mood of your event? At Balloons Guru, we dream of providing all customers with balloons and decorations without burning a hole in their pockets. Balloons Guru strives to be one of the most affordable balloon suppliers in Singapore. 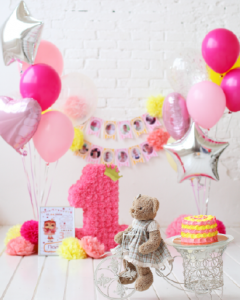 Balloons Guru is a Singapore-based company that specializes in balloons, decors and party supplies for any occasion: birthdays, proposals, weddings, baby showers and more. We provide a wide variety of products and services that is sure to cater to your every need. We have pearlized and solid coloured latex balloons, alphabets and number foil balloons, pet walkers, air walkers, balloons bouquets, balloon archs, flower pom-poms, paper fans, flower petals, garlands and various food decors. We even offer packages that include printing services such as customized balloon printings, invitation cards printings and photo cards printing. Balloon is happiness and Balloons Guru strives to bring that happiness to you at every occasion. Copyright © 2017 Balloons Guru. Brand managed by eZvent. All rights reserved.